After complaining for months about our decidedly unspring-like weather, summer came and we were hit with a few days of temperatures in the mid-nineties. And you guessed it…we complained some more. Apparently we have turned into Goldilocks on her quest for the best porridge. We don’t want it too cold, too rainy, too windy, too hot, too humid, too cloudy. Andy stands by seventy-six degrees as the perfect temperature. I will take seventy-six provided there is no wind and a spot in the sun for me to sit. Additionally, the evenings must not get too cool. Otherwise, I’m happy with a nice day in the low eighties and a light breeze. I know, I know…every time I talk about the weather I realize how spoiled we are, but what can I say? We are Californians, born and bred. As the weather heats up, so do the barbecues. Almost every night, at least one neighbor is grilling in their backyard; that enticing aroma wafting over the fence and through the open windows. It’s the kind of smell that makes your mouth water for the barbecue sauce, the steak, the chicken, the ribs, the corn on the cob. It makes you want to change your dinner plans and throw something on the grill yourself…either that or surprise your neighbors with two additional dinner guests. Even though we can generally grill year-round, there’s really nothing like grilling in the summer. It means nights when the sun stays up well past eight, no need for a sweater, and a smokiness that hangs in the air. These days remind me of summer break as a kid, when your only agenda was to ride your bike as fast as you could, get ridiculously dirty, and generally do the things that as an adult you might now deem stupid dangerous. And the next morning, all the neighborhood kids would congregate, bright and early, plotting the day’s events, nursing scrapes and bruises, ready to do it all over again. Those were the days of no responsibilities, when your only worry was if you had enough money to buy a slurpee. You wished with all your might that your mom wasn’t going to call you inside too early and that things could stay this way forever. Of course they didn’t; we grew up and summer took on a new meaning…beach vacations, drinks adorned by umbrellas, vegetable gardens, weddings, picnics and barbecues with family and friends. I can live with that. Combine all marinade ingredients together in the food processor. Puree until smooth. Combine marinade and meat in a zip-top bag or other container and marinate at least 5 hours or preferably overnight. For the sauce, roast tomatoes on the grill for a few minutes to soften and char slightly. Put tomatoes and remainder of sauce ingredients into food processor and puree until smooth. Salt to taste. (Sauce will be a bit spicy, but when combined with the meat, will mellow significantly.) Refrigerate until ready to use. 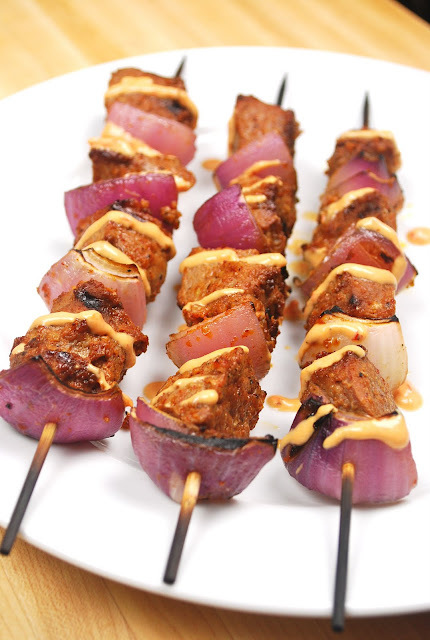 When ready to cook, thread meat onto skewers, alternating with red onion pieces if desired. Heat grill to about 400 degrees. Grill skewers for about 6-7 minutes total, turning once. Serve with dipping sauce on the side, or drizzle over skewers. These skewers are what summer is all about. 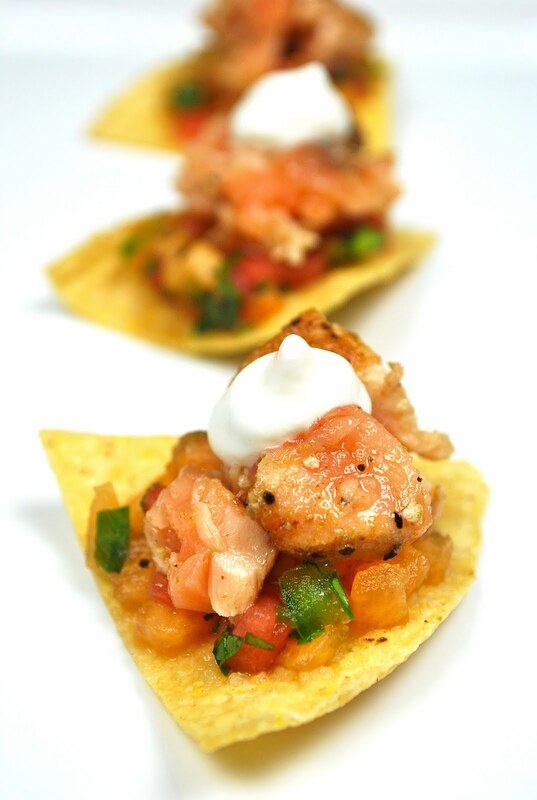 Grill lines on the meat, the crunch of sweet red onion, smoky and spicy flavors cooled by the tang of sour cream. And it all melds together perfectly to form one perfect summery bite. For your own chance to #GrillUpYourSummer with a new barbecue, visit http://www.GrillUpYourSummer.com and vote for your favorite recipe. (Pick me! Pick me!) By voting and entering your information, you will be entered to win a $50 Smart & Final gift card and a Weber 220 grill! The recipe with the most votes at the end of the week also wins. So what are you waiting for? 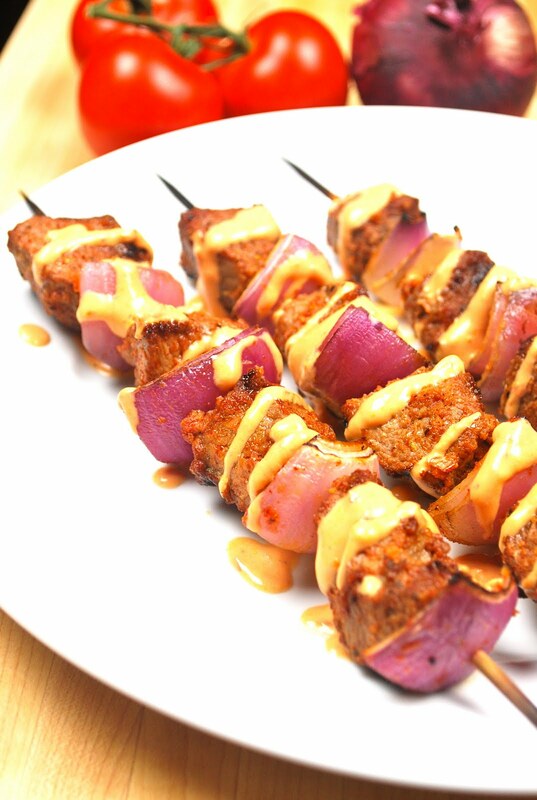 Go vote (for the Chili Onion Sirloin Skewers! ), and then get grilling! 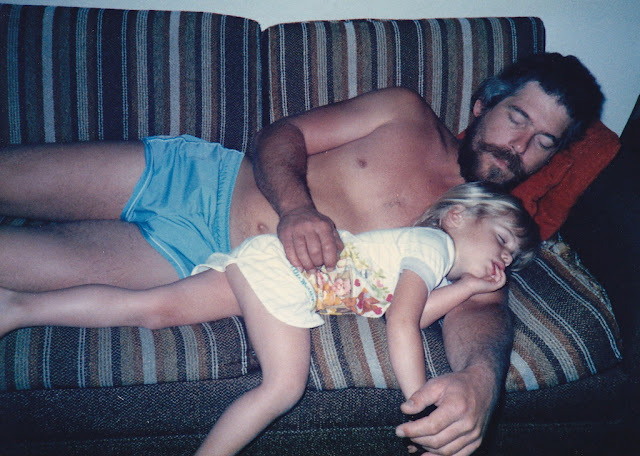 My picture should be in the dictionary next to the definition of “daddy’s girl.” I always have been and always will be a daddy’s girl…I am not ashamed to admit it and wouldn’t want it any other way. And on Father’s Day, more than any other day, I want him to know just how much he means to me. If you didn’t know my dad well, you’d think he was a man of few words. You’d see an imposing figure with long gray hair, a full beard and cowboy boots who you’d be just a little scared of if you met him in a dark alley by yourself (not that he spends a lot of any time in dark alleys). Very quickly, you’d figure out that he is fiercely protective of his family and would do anything for his girls. After a while you’d see that he’s chattier than he initially lets on, has an uncanny ability to tune out two daughters and a wife (a talent honed after almost 40 years of being the only man in the house), and that beneath his tough exterior is a gentle, loving, devoted husband and father. If you were really lucky, you’d get to experience the unfeigned way that he laughs when he REALLY laughs. I’m not talking about just a chuckle or a giggle here…he’s normally pretty low-key, but when something hits him just right, he laughs harder than anyone I’ve ever seen. It’s laughing to the point of red-in-the-face, not breathing, choking and coughing. These moments make up some of my favorite memories even though no one can remember exactly what he was laughing at because we’re all too busy laughing along with him. 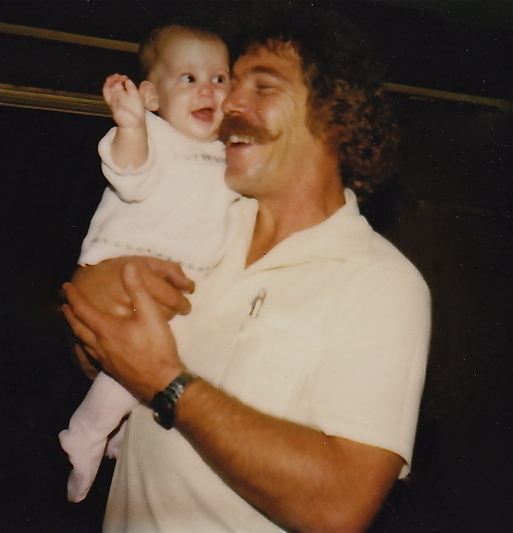 It’s impossible to recount all the wonderful times I have with my dad. I’m lucky that way…ours is the kind of relationship that didn’t have many bumps along the way and only continues to get better. Being a tomboy, there was softball, tennis, fishing and a period of infatuation with professional wrestling (don’t judge!). But nowadays, if I had to choose a favorite thing to do with my dad, it’s the time we spend together in the kitchen, which means more to me than he will ever know. He is the reason I have a love of food and cooking, and is just about the only person I would let touch my “good” knives. We bicker about what ingredients to use, laugh at the other when they do something wrong, completely ignore each other’s suggestions, tips and advice, and in general, have a blast. Because at the end of the day we both know that what we made is better than anything we would have made alone, and for all the needling and mocking, there is absolute respect and admiration. I love the look in my dad’s eyes when he’s in the kitchen, happily chopping vegetables, frying bacon, caramelizing onions. He’s full of life, in his element, doing something he loves. I cherish that time with him. So when I was thinking about what to make as a Father’s Day treat, I immediately thought of the enormous bag of miniature candy bars stashed in my pantry. They are hidden away because I’m the kind of person who can’t pass a candy dish without eating one (or seven) and this is definitely a trait I got from my dad. He is a chocoholic through and through. For pots de crème: In a small pot, heat heavy cream almost to a boil. Remove from heat and add candy bars and chocolate chips. Let sit for a few minutes to melt, then whisk to combine. Reserve for about 5 minutes to cool. In another bowl, beat egg and egg yolks with sugar. Whisk in a small amount of the chocolate mixture to temper the eggs, then slowly pour in the remainder, whisking constantly. Pour mixture into a large measuring cup through a sieve to remove any solids, then divide amongst ramekins. (I used ramekins that hold approximately 8 ounces.) Place ramekins in a hot water bath, cover with foil, and bake for 43-45 minutes, until set but still jiggly in the middle (yes, I said jiggly). Carefully remove from water bath and transfer to refrigerator to chill for at least several hours or overnight. When ready to serve, heat caramel squares and heavy cream in a small saucepan over low heat. When caramel starts melting, stir constantly to combine until completely melted. Spoon onto the top of the pots de crème. Meanwhile, make the whipped cream by placing all ingredients in an electric mixer and whisking until stiff peaks form. Place a dollop of whipped cream on top of the caramel. Serve immediately. I’m not going to lie…these are ridiculously rich and made me feel like I never wanted to eat candy again. Of course that silly thought only lasted for about an hour before I was contemplating eating another one. The pots de crème themselves are lighter and fluffier than others I’ve had and have a definite Milky Way essence. Topping them with caramel really puts them over the top, and adding the chocolate whipped cream? Well, it’s a chocoholics dream come true. I think Dad will happily approve. 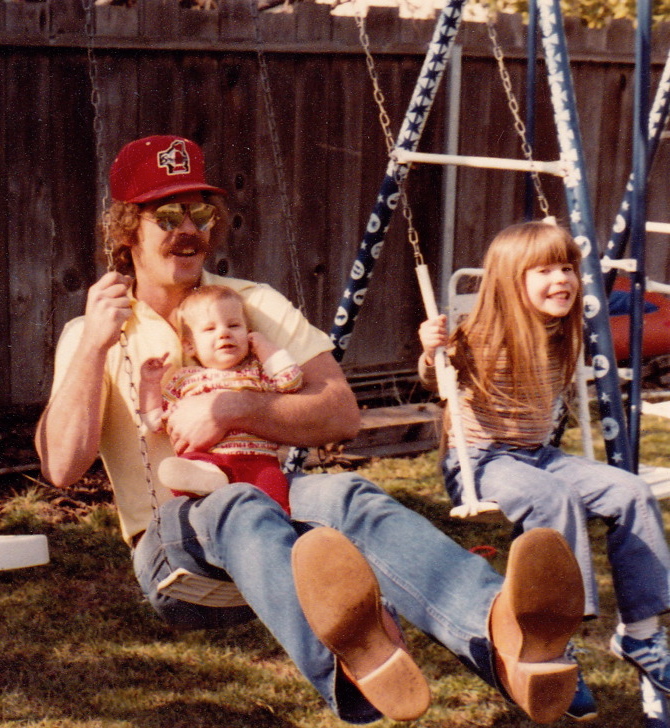 Happy Father’s Day, Daddy-o! I love you more than chocolate! Wasn’t I just talking about being in a rut when it came to using the same ingredients over and over? I needed to remind myself of that when I was thinking about how to prepare the salmon filets that were sitting in the refrigerator. As I scanned the produce bins, my eyes immediately landed on the leeks, just begging me to pair them with roasted garlic in a buttery sauce to pour over the salmon. Now, as I type this with my mouth watering for a butter and garlic infused creation, I’m wondering why I didn’t just embrace the rut? Why mess with the perfection of tried and true flavor combinations? Who needs variety anyway? Well, as you can probably gather from the photos, I pushed all things leek and garlic-related out of my mind and made an effort to look beyond the standards that were staring back at me. I looked into the refrigerator and saw cantaloupe and Greek yogurt sitting near each other and inspiration struck! Slowly, and with no idea that these flavors had a fighting chance of working together, I started to compile a dish in my head. For the salsa, mix all ingredients together and chill until ready to use. For the yogurt, combine yogurt and habanero in a mini food processor. Run until habanero is very finely minced. Transfer yogurt to bowl of an electric mixer, fitted with the whisk attachment. Add heavy cream and mint. Turn mixer on high and run until soft peaks form. When ready to sear the salmon, combine all spices together on a plate. Place each salmon filet in spices and coat both sides evenly. Heat canola oil on high heat in a non-stick pan. Place salmon filets in pan and let sear for 1-2 minutes per side, depending on thickness. (It should still be rare in the thickest part.) Remove from pan and cut the salmon into chunks. This dish turned out better than I had hoped and the flavors all worked very well together. The yogurt was the runaway success with the tang and spice livening up each bite. 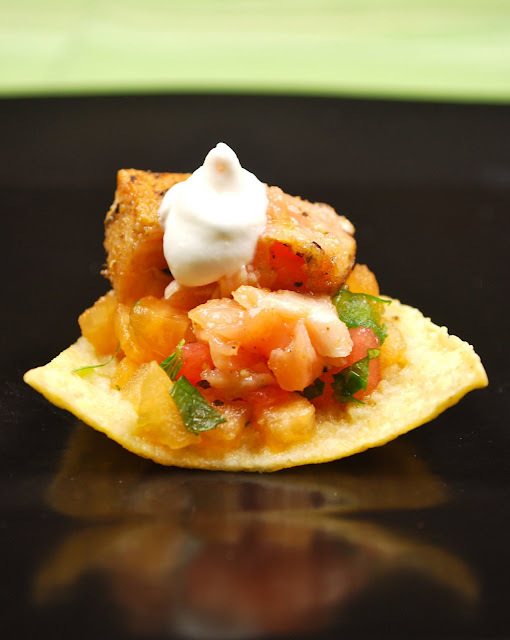 Mint added brightness, the fruit salsa added an overall coolness, and the tender salmon melted in your mouth. I’ve said before that I know if Andy likes something if his eyes get wide when he takes a bite…I’m happy to report very wide eyes with this one. So I guess the moral of the story is that if you push yourself to use different ingredients, you’ll come up with a new and exciting dish. However…all I can think about now is that leek and butter sauce! That does it…I’m going back to my rut, at least for a day or two. Sometimes I feel like I get into a bit of a rut when it comes to ingredients. There are tried and true flavors and combinations that are hard to step away from. And if you ask me, everything is made better by garlic, jalapenos, Sriracha sauce, or Sambal Oelek (another chili sauce). I try to remember that my goal is to experiment with dishes and to push my limits outside of my own comfort zone. But then I go to the farmer’s market and head straight for my favorite stalls where the vendors know me and greet me with a smile, and I can always count on gorgeous leeks and fennel, fat spring onions, bright red bell peppers, and those spicy jalapenos that I just have to buy. Other things will catch my eye that I might buy on impulse, not quite knowing what I’m going to do with them once I get home, but lately, my refrigerator has been full of familiar items that I can use to pull a dinner together really thinking about it. So the last few days I’ve been wracking my brain to come up with some dishes that are outside of the norm for me. I had some ideas down, and then an opportunity presented itself: Smart & Final wanted me to go check out their new bulk section at a nearby store and create a recipe using bulk bin items. Immediately, my mind went to granola bars. Now I know that for a lot of people, granola bars are very firmly inside their comfort zones, but the only granola bars I’ve ever eaten are the kind graced by a smiling man in a Quaker hat. And since I’m no longer drinking from a sippy cup, there’s really no good excuse to eat those. Time to try something new! Having no idea what I wanted to put in my granola bars, I was a bit overwhelmed by all my choices at the bulk bins…the selection was huge. All kinds of nuts, dried fruit, grains, beans, pasta, cereal, candy, snack mixes, and baking goods were represented, along with a selection of fresh coffee beans. Talk about a kid in a candy (er, bulk?) store. 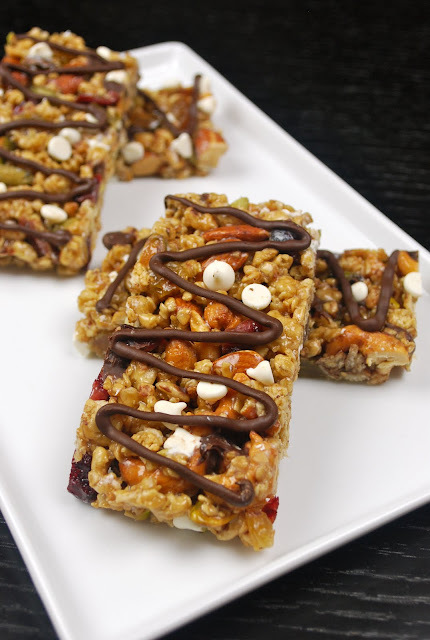 After finally settling on the maple pecan granola, I started choosing other items to add to my granola bars. Really, anything goes here, and if you like it, throw it in. The combinations are endless. Toss first 7 ingredients together in a large bowl. In a saucepan, heat butter, sugar, honey and syrup. Bring to a simmer. Simmer for a few minutes until sugar is dissolved. Pour immediately over granola mixture in bowl and stir to combine, making sure all the mixture is coated in syrup. Stir in 1/3 cup chocolate chips and 1/4 cup yogurt chips (they may melt slightly). Pour granola mixture into an ungreased 9”x13” baking pan (I used metal). Using your fingers, press mixture firmly into pan. Sprinkle remaining 2 tablespoons of yogurt chips over the top and press in just to make stick. Refrigerate until firm, at least 1 hour. When ready to serve, run knife around the edge of the pan. Turn pan over onto a large cutting board. (The entire sheet should pop out. If not, bang the back of the pan a bit.) Cut into bars. Microwave remaining 1/3 cup of chocolate chips until melted and smooth. Transfer melted chocolate to a plastic baggie and snip the corner off to create a piping bag. Pipe chocolate onto each bar as desired. Return to refrigerator for a few minutes for chocolate drizzle to firm up. With no offense to the Quaker man, and at the risk of sounding immodest, these are the best granola bars I’ve ever had and are so much better than anything out of a package. Every bite surprises you with a different flavor and there’s just the right amount sweet and salty. They’re nutty, chewy, chocolaty, and could almost pass as dessert (depending on your level of sweets addiction). And with the added bonus of not having to turn an oven on means I will be making these again and again. As a member of the #sfsmarties group, I work with Smart & Final providing feedback and using their products. This post has been compensated by Collective Bias. All opinions are my own.